Italy's most successful wartime bomber, the S.79 saw combat with the Regia Aeronautica in France, Yugoslavia, Greece, North Africa, East Africa and in the Mediterranean. Initially developed as a transport, the aircraft evolved into a dedicated medium bomber during the Spanish Civil War in 1936. The manufacturer then produced the S.79-II torpedo-bomber which entered service in 1939 - which primarily saw service against the Royal Navy in the Mediterranean. 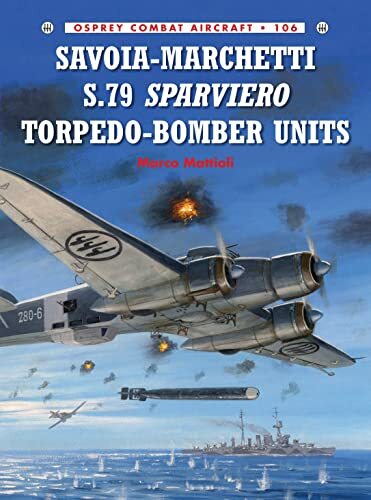 Illustrated with 30 full colour profiles of the main units that saw action with either the Regia Aeronautica or the ANR, this title is the first of two volumes to cover the development history and wartime performance of the S.79. The humpbacked, three-engined S.79 was the Regia Aeronautica's most effective weapon during World War 2. Dubbed the Gobbi Maledetti ('damned hunchbacks') by those that flew the aircraft, the S.79 was Italy's most recognisable combat aircraft. A native of Rome, Marco Mattioli has been interested in military history since he was a teenager. In 1992 he joined the Italian National Journalist Order, after which he was employed as a writer for several leading Italian history publishers. A contributor to many important Italian history and defence magazines, as well as the author of a number of books on Italian military aviation, he wrote Osprey Aviation Elite Units 38 - 53° Stormo. Richard Caruana is a Malta-based artist whose profile artwork is well known, and respected, in aviation modelling periodicals such as Scale Aviation Modelling and Scale Models. He has illustrated all of Osprey Aviation's Italian World War 2 titles.